1. Introduction to Management Science (12th Edition) by Bernard W. Taylor III. 2. Introduction to Mathematical Programming: Operations Research, Vol. 1 (Book & CD-ROM) by Wayne L. Winston – Munirpallam Venkataramanan. 3. The Six Sigma Handbook, Fourth Edition by Thomas Pyzdek – Paul A. Keller. 4. Introduction to Operations Research with Access Card for Premium Content by Frederick S. Hillier. 5. Operations Research: Applications and Algorithms (with CD-ROM and InfoTrac) by Wayne L. Winston. 6. Operations Research: An Introduction (9th Edition) by Hamdy A. Taha. 7. Introduction to Management Science (11th Edition) by Bernard W. Taylor III. 8. Supply Management by David N. Burt – Sheila Petcavage – Richard Pinkerton. 9. Introduction to Operations Research with Student Access Card by Frederick S. Hillier – Gerald J. Lieberman. 10. Making Hard Decisions with Decision Tools Suite Update Edition by Robert T. Clemen – Terence Reilly. 11. Business Dynamics: Systems Thinking and Modeling for a Complex World with CD-ROM by John Sterman – John D. Sterman. 12. Optimization in Operations Research by Ronald L. Rardin. 13. Supply Chain and Logistics Management Made Easy: Methods and Applications for Planning, Operations, Integration, Control and Improvement, and Network Design by Paul A. Myerson. 14. Simulation Modeling Using @RISK: Updated for Version 4 by Wayne L. Winston. 15. The Principles of Product Development Flow: Second Generation Lean Product Development by Donald G. Reinertsen. 16. Supply Chain Logistics Management (McGraw-Hill/Irwin Series Operations and Decision Sciences) by Donald Bowersox – David Closs – M. Bixby Cooper. 17. Numerical Methods and Optimization: An Introduction (Chapman & Hall/CRC Numerical Analysis and Scientific Computing Series) by Sergiy Butenko – Panos M. Pardalos. 18. The Definitive Guide to Transportation: Principles, Strategies, and Decisions for the Effective Flow of Goods and Services (Council of Supply Chain Management Professionals) by CSCMP – Thomas J. Goldsby – Deepak Iyengar – Shashank Rao. 19. Applied Linear Statistical Models by Michael Kutner – Christopher Nachtsheim – John Neter – William Li. 20. Integer Programming by Laurence A. Wolsey. 21. The Essentials of Supply Chain Management: New Business Concepts and Applications (FT Press Operations Management) by Hokey Min. 22. Designing Delivery: Rethinking IT in the Digital Service Economy by Jeff Sussna. 23. An Introduction to Management Science: Quantitative Approaches to Decision Making (with CD-ROM and Crystal Ball Pro Printed Access Card) by David R. Anderson – Dennis J. Sweeney – Thomas A. Williams – R. Kipp Martin. 24. Supply Chain Engineering: Models and Applications (Operations Research Series) by A. Ravi Ravindran – Donald P. Warsing Jr..
25. Demand Driven Performance by Debra Smith – Chad Smith. 26. Applied Simulation Modeling (with CD-ROM) (Duxbury Applied Series) by Andrew Seila – Vlatko Ceric – Pandu Tadikamalla. 27. Statistical Techniques in Business and Economics by Douglas Lind – William G. Marchal – Samuel Wathen. 28. Making Hard Decisions with Decision Tools Suite Update 2004 Edition by Robert T. Clemen – Terence Reilly. 29. Linear Programming by James P. Ignizio – Tom M. Cavalier. 30. The Definitive Guide to Inventory Management: Principles and Strategies for the Efficient Flow of Inventory across the Supply Chain (Council of Supply Chain Management Professionals) by CSCMP – Matthew A. Waller – Terry L. Esper. 31. Applied Linear Regression Models by John Neter – Michael H Kutner – William Wasserman – Christopher J. Nachtsheim. 32. AMPL: A Modeling Language for Mathematical Programming by Robert Fourer – David M. Gay – Brian W. Kernighan. 33. Data Mining: Theories, Algorithms, and Examples (Human Factors and Ergonomics) by Nong Ye. 34. Principles of Risk Analysis: Decision Making Under Uncertainty by Charles Yoe. 35. Machining for Hobbyists: Getting Started by Karl Moltrecht. 36. 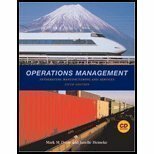 Operations Management: Integrating Manufacturing and Services, 5th Edition by Mark M. Davis – Janelle Heineke. 37. The Supply Chain Management Casebook: Comprehensive Coverage and Best Practices in SCM (FT Press Operations Management) by Chuck Munson. 38. Student Solutions Manual for Winston’s Operations Research: Applications and Algorithms, 4th by Wayne L. Winston. 39. So You Want To Be An Engineer: What to Learn and What to Expect by Ray Floyd – Richard Spencer. 40. Business Forecasting with Business ForecastX by J. Holton Wilson – Barry Keating – Inc. John Galt Solutions. 41. Global Supply Chains: Evaluating Regions on an EPIC Framework – Economy, Politics, Infrastructure, and Competence: “EPIC” Structure – Economy, Politics, Infrastructure, and Competence by Mandyam Srinivasan – Theodore Stank – Philippe-Pierre Dornier – Kenneth Petersen. 42. Methods of Operations Research (Dover Books on Computer Science) by Philip M. Morse – George E. Kimball. 43. Business Analytics Principles, Concepts, and Applications with SAS: What, Why, and How (FT Press Analytics) by Marc J. Schniederjans – Dara G. Schniederjans – Christopher M. Starkey. 44. Unit Operations of Chemical Engineering by Warren McCabe – Julian Smith – Peter Harriott. 45. Principles of Forecasting: A Handbook for Researchers and Practitioners (International Series in Operations Research & Management Science) by . 46. Linear Programming: Foundations and Extensions (International Series in Operations Research & Management Science, 37.) by Robert J. Vanderbei. 47. Dynamic Supply Chains: How to design, build and manage people-centric value networks (3rd Edition) by John Gattorna. 48. Poultry Meat Processing, Second Edition by Casey M. Owens. 49. Business Analytics Principles, Concepts, and Applications: What, Why, and How (FT Press Analytics) by Marc J. Schniederjans – Dara G. Schniederjans – Christopher M. Starkey. 50. Strategic Decision Making: Multiobjective Decision Analysis with Spreadsheets by Craig W. Kirkwood. 51. Business Analytics with Management Science Models and Methods (FT Press Analytics) by Arben Asllani. 52. The Definitive Guide to Order Fulfillment and Customer Service: Principles and Strategies for Planning, Organizing, and Managing Fulfillment and … of Supply Chain Management Professionals by CSCMP – Stanley E. Fawcett – Amydee M. Fawcett. 53. Schaum’s Outline of Operations Research by Richard Bronson – Govindasami Naadimuthu. 54. Risk Analysis in Engineering: Techniques, Tools, and Trends by Mohammad Modarres. 55. Real-World Data Mining: Applied Business Analytics and Decision Making (FT Press Analytics) by Dursun Delen. 56. Supply Chain Management Demystified by John M. McKeller. 57. Construction Operations Manual of Policies and Procedures, Fifth Edition by Sidney M. Levy – Andrew M. Civitello Jr..
58. Introduction to Operations Research by Joseph G. Ecker – Michael Kupferschmid. 59. Mathematical Modelling Techniques (Dover Books on Computer Science) by Rutherford Aris. 60. Operations Research: An Introduction (8th Edition) by Hamdy A. Taha. 61. Introduction to Probability Models, Tenth Edition by Sheldon M. Ross. 62. The Definitive Guide to Warehousing: Managing the Storage and Handling of Materials and Products in the Supply Chain (Council of Supply Chain Management Professionals) by CSCMP – Scott B. Keller – Brian C. Keller. 63. Applied Linear Statistical Models by John Neter – Michael Kutner – William Wasserman – Christopher Nachtsheim – John Neter. 64. Introduction to Management Science (10th Edition) by Bernard W. Taylor III. 65. Difference and Differential Equations with Applications in Queueing Theory by Aliakbar Montazer Haghighi – Dimitar P. Mishev. 66. Modeling Techniques in Predictive Analytics with Python and R: A Guide to Data Science (FT Press Analytics) by Thomas W. Miller. 67. Introduction to Management Science (11th Edition) by Bernard W. Taylor III. 68. Project Management Tools and Techniques: A Practical Guide by Deborah Sater Carstens – Gary L. Richardson – Ronald B. Smith. 69. The Handbook for Quality Management, Second Edition: A Complete Guide to Operational Excellence by Thomas Pyzdek – Paul A. Keller. 70. Machine Shop Trade Secrets by James Harvey. 71. Production Planning and Industrial Scheduling: Examples, Case Studies and Applications, Second Edition by Dileep R. Sule. 72. Solutions CD-ROM for Student Solutions Manual for Winston’s Introduction to Probability Models: Operations Research, Volume II by Wayne L. Winston. 73. The Definitive Guide to Supply Chain Best Practices: Comprehensive Lessons and Cases in Effective SCM (Council of Supply Chain Management Professionals) by CSCMP – Robert Frankel. 74. Blackett’s War: The Men Who Defeated the Nazi U-Boats and Brought Science to the Art of Warfare by Stephen Budiansky. 75. Decision Making with Insight (with Insight.xla 2.0 and CD-ROM) by Sam L. Savage. 76. Introduction to Operations Research and Revised CD-ROM 8 by Frederick Hillier – Gerald Lieberman. 77. Senior Living Communities: Operations Management and Marketing for Assisted Living, Congregate, and Continuing Care Retirement Communities by Benjamin W. Pearce. 78. Managerial Analytics: An Applied Guide to Principles, Methods, Tools, and Best Practices (FT Press Analytics) by Michael Watson – Derek Nelson – Peter Cacioppi. 79. On the Menu: The Art & Science of Profit (The Restaurant Secret Formula) (Volume 2) by Ronald F Bryant. 80. Introduction to Discrete Event Systems (The International Series on Discrete Event Dynamic Systems) by Christos G. Cassandras – Stephane Lafortune. 81. Introduction to Management Science, Student Value Edition (11th Edition) by Bernard W. Taylor III. 82. Operations Research Calculations Handbook, Second Edition (Operations Research Series) by Dennis Blumenfeld. 83. Lean Healthcare Deployment and Sustainability by Mark L. Dean. 84. The Lean Design Guidebook: Everything Your Product Development Team Needs to Slash Manufacturing Cost (The Lean Guidebook Series) by Ronald Mascitelli. 85. Introduction to Probability Models: Operations Research, Volume II (with CD-ROM and InfoTrac) by Wayne L. Winston. 86. Probability Foundations for Engineers by Joel A. Nachlas. 87. Reliability, Maintainability and Risk: Practical Methods for Engineers including Reliability Centred Maintenance and Safety-Related Systems, 8th Edition by David J. Smith BSc PhD CEng FIEE FIQA HonFSaRS MIGasE..